Ekiti state governor, Ayo Fayose, says he stands by his previous statement that President Buhari was on life support during this his visit to the UK for medical attention. Fayose had in June, released a statement claiming that President Buhari was on life support and needs Prayers from Nigerians. He even said he had photos to back up his claim. 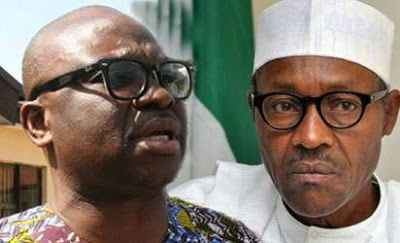 In this recent interview, Fayose says just before these recent visits by some governors to President Buhari, he was incapacitated and was on life support. "What I said about the president is very clear. I said that the President at a point before these recent visits was incapacitated and has been on a life support. I stand by it. I stand by it. I have no regret for that statement. You would recall that I said the Handlers of the President should produce evidence to the contrary within 48 hours. After 4 weeks, they said they went to visit the president. Thank God the President is getting better now but there is no denying that what I said at the time was the truth. If you go by the statement of the governor of Ebonyi, he said the President's recovery is a miracle, it is divine which means something had gone the other way round before becoming a miracle. I read in another piece that the President came up like Lazarus from the dead. Well, that is another person saying that.